This week's Illustration Friday challenge was "Smart." I think the intelligence of the crow is super cool, and I love fables and folklore, so I chose to illustrate Aesop's The Crow and the Pitcher. This week's Illustration Friday challenge topic was "Orbit." Similar to the "Moon" collage from a couple weeks ago, I used photos of grungy and decaying textures to create a scene that was recognizable, but almost accidentally so. I really enjoyed creating this piece for last week's Illustration Friday's challenge, and I was stoked that I was able to submit again this week. This week's theme: "Tropical." I've created art a couple times in 2015 for Illustration Friday's weekly challenge, but in 2016, I'm planning to submit something new at least one week each month. Below was my submission for last week's challenge, "Moon." I sketched a collage of hot chocolates last night, and I'd love to see what people can do with it. Add a zentangle? Draw logos or pictures on the mugs? Color with 3 colors, or color with 10? Below is a preview of my sketch. If you'd like to download and print a hi-res version, you can find it here (available as a JPG and a PDF). Please find me on Instagram and post your final Hot Cocoa art for me to see! I am so happy to have three more illustrations in the latest issue of Girls' World Magazine! I really enjoy working with their art director, and it was another great experience all around. Yesterday, I submitted another illustration for the Tomie dePaola Award. This is my third year participating — I blogged about the 2013 contest here, and I was a semi-finalist for my 2014 submission, which you can see here. "When Little Red Riding Hood had only been walking a few minutes, a wolf came up to her. She didn’t know what a wicked animal he was, so she wasn’t afraid of him." Busy October, gallery shows and more to come! It has been a very long time since I've updated my blog, and I hope you're still catching my posts on Facebook and Instagram! The month of October was a very busy and exciting time for me. I had a good deal of illustration work come in, AND I had my first group gallery show since college. In fact, I had TWO gallery shows in October — one opened in Iowa on the 16th and the other opened in NYC on the 24th. I'll update more about the illustration jobs soon, as well as details on an upcoming solo show, but here is a shot of the watercolor and collage work that was at the show in Cedar Rapids ("Rabbit," "Meeting the Wolf" and "Crow"). As always, your questions and comments are most welcome! 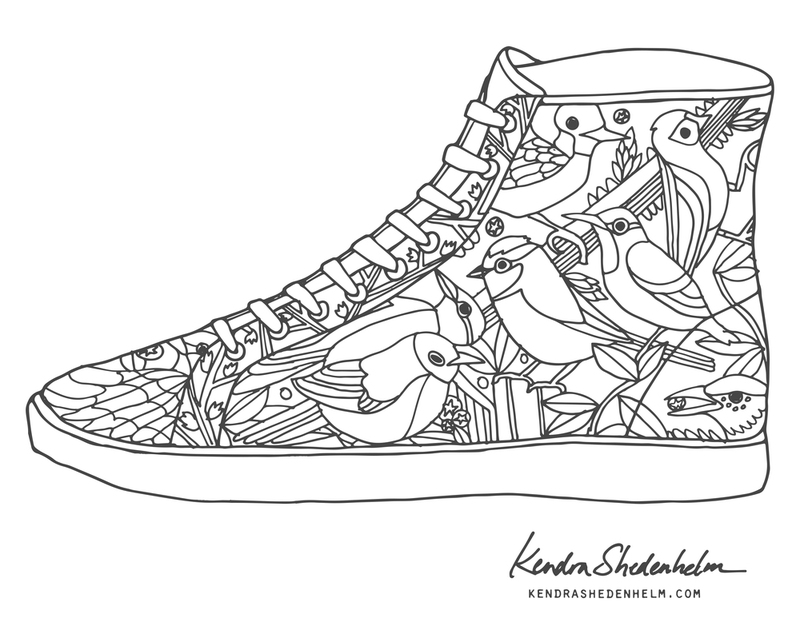 I submitted my hi-top coloring page to bucketfeet.com, and it was accepted to go to the next round for product testing! 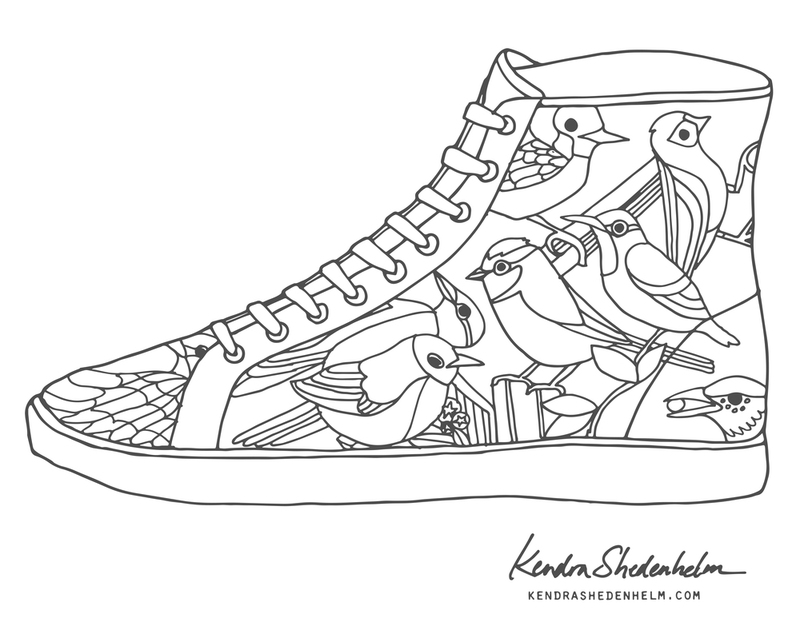 Because I'd actually drawn the art onto my shoe outline, I needed to re-create the design into 4:5 print-ready vector art. Below is my final reinterpretation, and I've also uploaded it here as a free, downloadable coloring page (PDF and JPG). Enjoy, and don't forget to tag me on your colored piece on Instagram! On Friday, I submitted my entry for the Lilla Rogers Global Talent Search. This was my third year of creating work for this competition, and it proved to be as challenging and rewarding as ever. This year, we were given a story about a fictitious young woman who lived in Brooklyn. The brief showed us a picture of her (and her clothing style), where she shopped, where she worked, products she'd buy, products she sold in her shop, the food truck she stopped at, and so on. With this type of person in mind, the assignment was to create a patterned sneaker that she could wear when she bicycled to work. 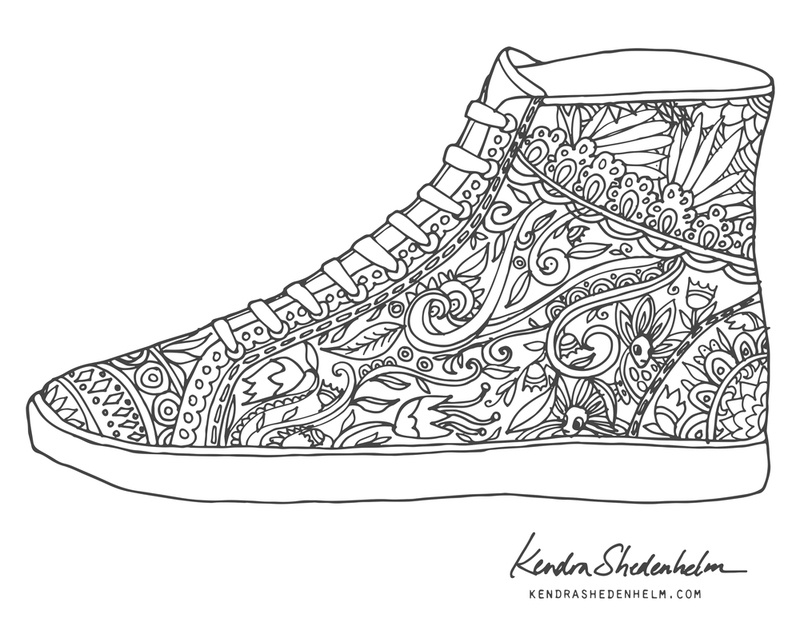 The patterned shoe also needed to incorporate at least one word, hand-written or an actual font. Although I really liked this approach of getting a visual story about the client, I did find it tricky to create something for a person I couldn't really relate to, while still keeping myself in the art. So I focused on whatever images I was drawn to in the brief. In her shop, she sold some darker, occult-type of items, so I decided to go with a crow theme. They are one of my favorite birds – strong, smart and ominous, and I knew I would enjoy drawing them. She also sold some pretty, Parisian-style gifts, which made me envision using a loose, dreamy watercolor style for my pattern. You can see my 2014 and 2013 submissions here and here. I'm loving my new Artwin watercolor pen. I find it lends itself to the quick gesture sketches that I really enjoy creating, and the set up and clean up is minimal. For my son's 7th birthday party, I decided to silkscreen t-shirts for all the guests to take home with them. Archer is really into Pokémon right now, so he and I looked through several books to find the right Pokémon character for our tees. We finally agreed on Fletchling. It's a cute, typically-peaceful Pokémon, and I felt it could be simplified fairly easily. After I received my Speedball Fabric Screen Printing Kit and my t-shirts, I procrastinated for several days before even opening the packages. I haven't attempted a silkscreen print since the 90s, and I don't remember ever using drawing fluid, so I was pretty nervous about the results. It came out okay, but, as you can see, there was screen filler in his eye, and the filler had also bled into the top of his beak and wing (I'm assuming my drawing fluid was too thin). With a cotton swab and detergent, I scrubbed the Screen Filler out of these areas, and then touched up the edges with Screen Filler and a paintbrush. Once that dried, I was ready to print. I stuffed a piece of waxed paper inside each t-shirt to prevent the ink from bleeding through. I then laid the screen on top of the tee, added a thick line of fabric ink at the top, and my son squeegeed the ink across the screen and onto the shirt. Overall, it was a success. The kids seemed to like them a lot, Archer and I were able to create something together, and I tried a new art process. Have questions or suggestions? Your comments are always welcome! As I wrote in my last post, I'm taking another Make it in Design course with Rachael Taylor this summer. My previous post was about my intermediate track submission, but I also submitted to the advanced track. The advanced assignment focused on "Past Modern," with keywords like ornate, ornamental, geometric, and laser cut. 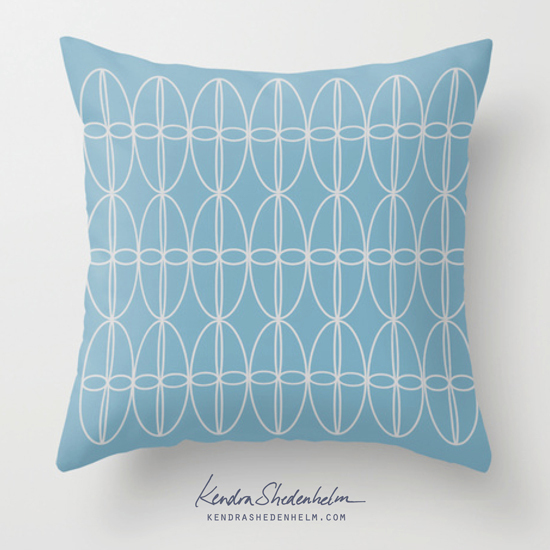 Although I initially spent my time drawing floral elements (which I've done plenty of in the past), I decided to try some geometric shapes in Illustrator, and I ended up with a whole new group of work that I really enjoyed creating.